Amber Lambke, Renee Page, and Ron Adams stand inside the gristmill in Skowhegan, Maine, where Maine Grains creates traditional stone-milled flours and other products from local grains. John Hoffses and Renee Page stand inside a greenhouse that John manages for the school farm at MSAD #1 in Presque Isle, Maine. Students at UMaine Presque Isle march on campus to ask for more local and real food as a part of the Maine Food for the UMaine System coalition effort in 2015. Students are hard at work at Kennebec Valley Community College as part of their culinary training. Preparing local foods is part of the curriculum for these students at KVCC. 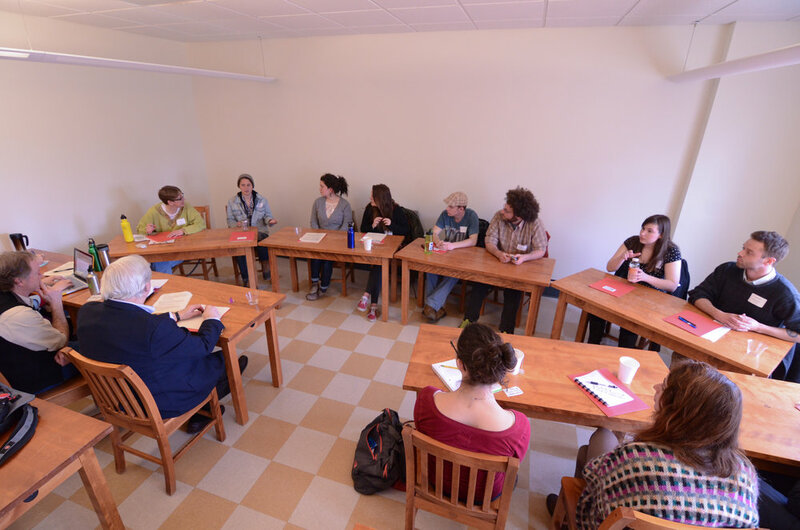 Farm to Institution New England hosted a farm to college gathering at St. Joseph's College of Maine in Standish in 2014 to allow stakeholders to come together and talk about local foods on campuses in the state. Waldo County General Hospital highlights the local foods on the menu for the day on this board. North Branch Farm, an organic farm in Monroe, ME, sells produce to area institutions, including Waldo County General Hospital.